Fly for free from select gateways and save up to $1,000 per couple off this cruise. Plus, receive a $500 per stateroom shipboard credit. Expires April 30. Click here for eligible departures. Welcome to Prague, capital of the Czech Republic. Transfer from the airport to your hotel. * After checking in for a 2-night stay, enjoy free time to explore this celebrated city, or join our “welcome walk” to stretch your legs and get oriented. Sail Europe’s most iconic rivers: the Main, lined with quaint villages; the castle-studded Rhine; and the Moselle with its steep vineyards. Explore Prague’s Lobkowicz Palace on a Privileged Access tour designed just for us by Prince William. Survey the Rhine from 900-year-old Marksburg Castle. Taste legendary Moselle Rieslings. Savor Czech, German and French cuisine. 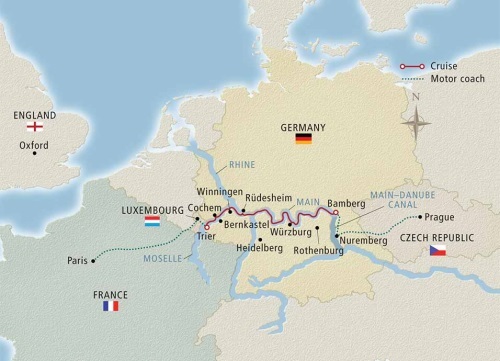 With bookends in Prague and Paris, this 12-day journey celebrates Europe’s most luminous ports.